Boasting desert plains, canyons, mesas and the highest summit in the entire Rocky Mountain range, Mount Elbert, the geographically varied state of Colorado is home to a rich diversity of wildlife, including 19 species of lizards. From the vibrant collared lizard to skinks who burrow into the sprawling plains, four distinct families of lizards roam the vast, rugged land like miniature relics of a prehistoric age. Two species of the family Crotaphytidae inhabit Colorado: the collared lizard (Crotaphytus collaris) and the longnose or long-nosed leopard lizard (Gambelia wislizenii). Crotaphytids are large lizards with large heads, long tails and long limbs. Unlike other lizard families, they display an unusual form of salutatory bipedalism that allows them to run at breakneck speeds and jump effortlessly between boulders. Nine species of lizards in the family Phrynosomatidae live in Colorado: the lesser earless lizard (Holbrookia maculata), the Texas horned lizard (Phrynosoma cornutum), the short-horned lizard (Phrynosoma hernandesi), the round-tail horned lizard (Phrynosoma modestum), the sagebrush lizard (Sceloporus graciosus), the desert spiny lizard (Sceloporus magister), the eastern fence lizard (Sceloporus undulatus), the tree lizard (Urosaurus ornatus) and the side-blotched lizard (Uta stansburiana). The most species-rich lizard in North America, Phrynosomatids are relatively small lizards with few common denominators between family members. This remarkable diversity between individual species has led researchers to use them in many ecology and life history studies. More Phrynosomatids occur in arid environments where they have thrived for 55 million years. While some Phrynosomatids lay eggs, making them oviparous, others bear live young and are viviparous. Three species of skinks in the Family Scincidae exist in nature in Colorado: variable skink (Eumeces gaigeae), many-lined skink (Eumeces multivirgatus) and Great Plains (Eumeces obsoletus) skinks. These "scincids" bear some resemblance to other lizards, they are different in form and structure; their elongated bodies are cylindrical and most have barely discernible heads and short, or sometimes absent, limbs. Their smooth, shiny, semi-circular overlapping scales are imbricated, or overlapping; and they are more dependent on moist habitat than most lizards. The key physiological difference between skinks and other lizards is their reproduction; nearly half of the species bear live young while most lizards lay eggs or hatch their eggs internally, which is called ovoviviparous, giving birth to live young with no placenta. Another characteristic that clearly differentiates the skink family from other lizards is their form of locomotion that closely resembles the movement of snakes, versus the movement of lizards with well-developed limbs. Five species of lizards in the family Teiidae are found in Colorado: triploid Colorado checkered whiptails (Cnemidophorus neotesselatus), six-lined racerunners (Cnemidophorus sexlineatus), diploid Colorado checkered whiptails (Cnemidophorus tesselatus), western whiptails (Cnemidophorus tigris) and plateau striped whiptails (Cnemidophorus velox). All 230 species of Teiids or whiptails have forked tongues and a common scale pattern unlike that of other lizards – the rectangular ventral scales are transverse, and small granular scales cover their backs. Their head scales are separate from the skull bones, and their teeth are fused to their jaw bones. They are also the only lizards in which certain species are all female, such as the diploid and triploid Colorado checkered whiptails, and reproduce without male fertilization. This is called parthenogenesis. 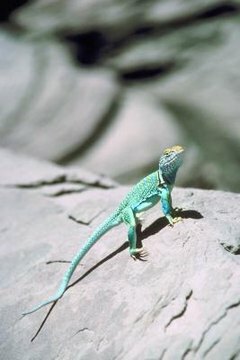 Also known as the mountain boomer, the 10-inch-long collared lizard (Crotaphytus collaris) ranges in color from light turquoise green to soft aqua with bright yellow bars interspersed horizontally across the back and a sprinkling of tiny white dots in the dorsal area. Males are more colorful than females, but several species of crotaphytids have females more brightly colored than males. Named for the prominent black-and-white bands behind their necks, collared lizards occur in rocky areas, sagebrush, desert scrub and the grasslands of Colorado. Their diet consists of arthropods such as grasshoppers and lizards, including their own species. Robust and stocky, the desert spiny lizard (Sceloporus magister) reaches an overall length of about 13 inches. It has large, pointed scales and a distinct black wedge on either side of its neck. Strokes of black extend from the rear of the eyes and mouth toward the tail. Like many lizards, this species' tail detaches easily but will grow back. The desert spiny lizard is a brownish to yellowish color with dark blotches and cross bands. Found mainly in rocks on the ground in arid desert scrub and thorn scrub areas of Colorado, the creature has a diverse diet that consists of insects and their larvae, such as grasshoppers, centipedes, caterpillars and ants. They occasionally eat small lizards, young birds, plants and their flowers and berries. As their name suggests, terrestrial Great Plains skinks (Eumeces obsoletus) primarily dwell on the open plains and rolling grasslands of Colorado. The largest skinks in North America, they are nearly 14 inches long from snout to the tail tip. Burrowing lizards, they form dugouts in the sand and under rocks. They emerge from their winter dormancy in late April, and females stay underground with their eggs until they hatch in August. Uncharacteristically maternal for reptiles, female skinks clean their hatchlings and protect them from predators. Carnivorous, Great Plains skinks live for about six years in the wild, subsisting on a diet of caterpillars, grasshoppers, crickets, beetles and spiders. Found throughout Southeastern Colorado in woodlands, rocky hillsides, canyons, scrublands and open savannahs, the rather rare and unusual triploid Colorado checkered whiptails are a species made up entirely of females who reproduce parthenogenetically. Egg cells develop without male fertilization, and offspring are genetically identical to their mothers. They have long, black, slender bodies with extremely long, whiplike tails. Their diet consists of grasshoppers, beetles, termites and caterpillars. Are Yellow Spotted Lizards Dangerous to Humans?